Our wide range of commercial scrubber dryer and industrial scrubber dryer machines provide the ideal cleaning solution. To view our complete range of industrial floor scrubber dryers and commercial floor scrubber dryers below. A floor scrubber dryer is the ideal floor cleaner for any hard floor area. It will not only scrub and clean your floor surface with water and cleaning chemicals, but will dry it as well. Scrubber dryer machines combine the scrubbing function of a rotary cleaning machine with the suction capabilities of a vacuum cleaner allowing both cleaning processes to be carried out in a single pass. Constant brush pressure from the machine guarantees both successful and uniform scrubbing results on many different floor surfaces. The ergonomic design of all the machines ensures that the scrubber dryers are highly manoeuvrable and easy to use. For cleaning and scrubbing small hard floor areas we offer walk behind scrubber dryers also know as pedestrian scrubber dryers. These machines range in size from a small compact floor cleaning machine such as the C22 43 with its 25 litre solution tanks and 35omm scrubbing width making it ideal for corridors or reception areas. Through to larger walk behind floor scrubber dryer machines such as the T300 which has a wider scrubbing width of 500mm and a 42 litre tank capacity. This machine also comes with added technologies such as ec-H2O NanoClean™ technology which reduces chemical consumption which not only helps to reduce costs but also contributes towards sustainability. For larger floor areas we provide a range of ride on floor scrubber dryer machines. 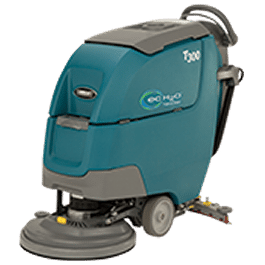 As with the small scrubber dryers these ride-on cleaning machines also vary in size, ensuring there is the right machine for the right cleaning need. The T7+65 is a battery powered ride on scrubber dryer with a 650mm scrubbing width. It is compact in design and the highly manoeuvrable handling enables it to clean tight spaces and narrow aisles. For more heavy duty or larger floor areas a sit on scrubber dryer such as the T20 diesel ride on scrubber dryer would be suitable. This large hard floor scrubber dryer cleaning machine gives wall to wall cleaning using its three driven disc brushes and scrubs aggressively at approximately 6500 square metres per hour.